Word or tag clouds are visualizations which help us to understand the meaning of an aggregate of text by correlating the size of the words with their prevalence in it. As the title suggests, the picture shown here describes the concept best. While the depictions are often correlated with blogs, twitter streams, and other social media, their utility extends beyond this area. In this post, we list several ways that life science companies can use word clouds to understand customers’ needs and adapt marketing and communication strategies to meet them. Analyzing Social Media Sentiment. For the life science marketer, comments made by life scientists on social media applications represent an ‘amorphous’ form of market research. Instead of direct questions being asked and answered, researchers give candid opinions about research areas, products, events, or anything else they want to talk about. 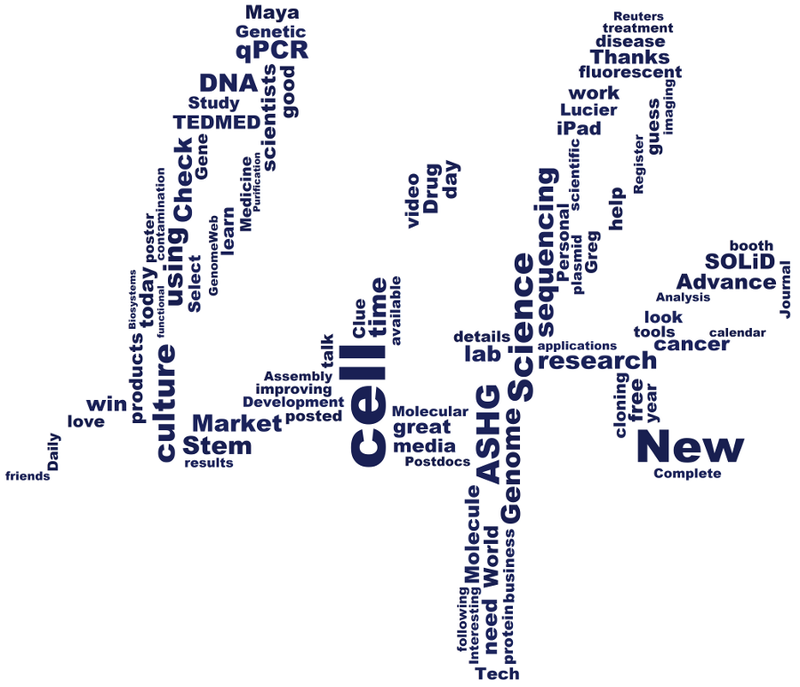 As an example, check out the word cloud made from the Society for Neuroscience 2010 meeting tweets. From this cloud, you can see that important topics at the meeting were Glenn Close‘s talk, an article about spooky coloured auras (from a non-American author), and that the exhibit hall booths were well represented. The raw data must be aggregated and analyzed, these associations may not be clear just from the word cloud. However, it concisely shows the ‘buzz’ at the meeting without having to read a single tweet. As such, word clouds can be used effectively understand and communicate the sentiment from conferences, tweet streams, forums, blogs, etc. Market Research. Although traditional surveys produce data that is more structured than social media sentiment, we’ve found that word clouds can be used to effectively capture important take home messages in market research. As an example, for our client 89 North we surveyed fluorescence researchers to determine the requirements for the fluorXchange, a web 2.0 resource for scientists. We got excellent answers to our open ended questions, and made a word cloud from all of the text. From the visualization, we confirmed that a major ‘pain’ for these researchers was related to improving the signal to noise in their experiments. As a result, we chose to include a wiki along with a forum which would allow them to upload experimental images and fully discuss signal to noise issues. For another example, see the word cloud from our poll of San Diego Biotechnology Network members we used to plan the 2010 meetings. Internal Motivation. Word clouds based on customer needs can help life science marketing, sales, and technical service groups convey a common message in everyday conversations, marketing materials, and can even help with product development. Help your team to understand by being creative: post or distribute ‘customer clouds’ in sales guides, give easy-to-update framed clouds for desks, or post them in hallways. Do ‘company clouds’ match your intended message? If not, make your own to emphasize words which more closely match your desired voice and post or distribute them. With cool tools like Tagxedo, you can make them artistic and in any shape, as we did with the LIFE logo above. Other tools to create tag clouds are Wordle (many artistic options) and TagCrowd (fewer artistic options, but word removal available). In addition, several Twitter and Blog tools will generate word clouds. We did this analysis for free, but it did require that we archive the information for 10 weeks, as the free tools rarely allow for this. At our Social Media for Life Science and Biotechnology Workshop 4 we discuss the paid and free tools, and ways to aggregate raw data from life science social media and analyze it. If you think that this technology seems too simple, consider that the more complex sentiment analysis software designed for larger brands requires much more data. Try word clouds with the data you have in house, you may be surprised with the insights you will gain and the ability to communicate your message internally and externally.